A little while ago, I attended a ball where one of the country dances was The Busie Body. When I was told that it was by John Essex, I thought I ought to explore further. In 1710, Essex translated Feuillet’s 1706 Recueil de contredances as For the Further Improvement of Dancing. What he translated was Feuillet’s introductory treatise on the simplified notation system used to record country dances. Instead of merely reproducing Feuillet’s collection of 32 country dances, Essex selected 10 from various sources. Three come from Feuillet’s 1706 Recueil: Pantomime; Gasconne; and The Female Saylor (La Matelotte in Feuillet). Two more dances are also French: Micareme and The Diligent, both from Feuillet’s VIme. Recüeil de danses et de contredanses pour l’Année 1708. The other five dances were, as Essex tells us in his Preface, ‘my own composing’. These are the dances titled Trip to the Jubilee, The Great Turk, The Busie Body, The Tatler and The Tost. If the French were acknowledged as the masters of ballroom and stage dancing, la belle danse, the English claimed primacy in country dancing. Essex was happy to wave the flag in his Preface to For the Further Improvement of Dancing. In this post, my interest lies in the titles of Essex’s own country dances and their links with stage and society in London. Trip to the Jubilee must refer to Farquhar’s play The Constant Couple; or, The Trip to the Jubilee, first performed (so far as we know) at the Drury Lane Theatre on 28 November 1699. Farquhar’s play was one of the most popular of the early 18th century and was performed regularly until the 1790s. The ‘Jubilee’ was the Pope’s Jubilee year to be celebrated in Rome in 1700 – a trip to this event was a running joke throughout The Constant Couple. The dance and its music were first published in 1701 in the 11th edition of The Dancing-Master, described ‘as ‘tis Danced at the Play-House’. So it seems that Essex actually created this country dance for Farquhar’s play. He is certainly recorded as a professional dancer at Drury Lane in the first years of the 18th century. The Great Turk uses music from the Turkish Entrée in Campra’s 1697 opéra-ballet L’Europe galante. Anthony L’Abbé made use of the same piece for his Türkish Dance in the early 1720s. Essex’s use of the music suggests that it was already familiar in London some years earlier. 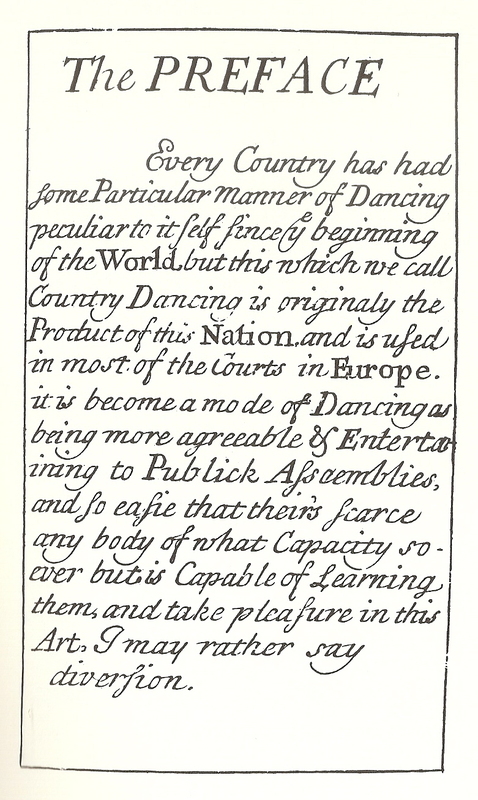 It is worth noting the danced entr’acte ‘Entertainment after the Turkish Manner’ given at Drury Lane on 2 February 1710. Did this perhaps also use Campra’s music? The title of The Busie Body is taken from Mrs Centlivre’s play of the same name, first given at Drury Lane on 12 May 1709. This was another successful comedy played regularly in London’s theatres until the end of the century. The published play has ‘A Dance’ towards the end, in accordance with the convention of a country dance performed by a play’s characters as the plot concludes. Could Essex’s dance have been performed in the original production of The Busie Body, even though he makes no mention of this? The Tatler, obviously, refers to the famous periodical launched by Sir Richard Steele in 1709 and published three times a week until 1711. It dealt in news, gossip and the manners of the day and was frequently reprinted in collected editions throughout the 1700s. Was this dance implicitly dedicated to a well-known ‘Toast’ of the Kit-Cat Club (of which Steele was a member and to which he was referring)? Or was it meant as a compliment to the Duchess of Bolton, to whom Essex dedicated his collection? She was Henrietta née Crofts (c1682-1730), the illegitimate daughter of James, Duke of Monmouth. She married the second Duke of Bolton in 1697. With his dances in For the Further Improvement of Dancing Essex is surely trying to appeal to a fashionable, London-based élite – the beau monde – members of which he hoped to attract as pupils. This entry was posted in Country Dancing, Dance Treatises & Notations, Dancers & Dancing Masters and tagged Baroque Dance, John Essex, Raoul Auger Feuillet on December 26, 2015 by moiragoff. When I first began to study baroque dance, I tried very hard to be authentic – not least because I was so often criticised for my ‘balletic’ approach. It took me some time to realise that such authenticity is impossible. We know a great deal about dancing in the late 17th and early 18th centuries (far more than most people realise), but there is just as much that we don’t and indeed cannot know. My own reconstructions of dances, particularly the solos danced by Mrs Santlow and Mlles Subligny and Guiot, owe as much (if not more) to my personal style and technique as a ballet-trained dancer as they do to the notations and dance manuals of the early 1700s. The subject of authenticity came into my mind again a week or so ago, when I went to a talk at the Wallace Collection. The speaker was the choreographer and Director of the Birmingham Royal Ballet David Bintley. His new ballet The King Dances is based on Le Ballet de la Nuit, the 1653 ballet de cour in which the fourteen-year-old Louis XIV appeared as the rising sun and became known ever after as the ‘Sun King’. Bintley talked about his forays into history and the world of baroque dance as he developed his choreography. He had gone so far as to have a baroque dance expert give instruction to his dancers – only to find that the unfamiliar style and technique was too difficult to learn in a short period. Although it marked the beginning of ballet, baroque dance was far from the strength and extension now characteristic of its descendant. At the time of writing, I have not seen Bintley’s The King Dances so I cannot comment on the ballet. However, the photographs of the production are stunning. The young male dancers look as fabulously glamorous as their youthful antecedents at the French court must have done. When they are caught in mid-step the effect is strangely evocative of the ballet de cour, as we glimpse it through the few surviving designs for costumes and scenes. Could Bintley’s work possibly be ‘authentic’ in ways that a production consciously attempting complete ‘authenticity’ could not? I thought about authenticity again this weekend, while I was taking part in a dance display for a heritage open day which also gave me time to watch. The dances – several cotillons by Dezais and a couple of ballroom duets – were all faithfully reconstructed from 18th-century sources. The costumes were handsome and in good period style, right down to the corsets. However, these were not the essential factors that made the display authentic. There was a range of skills and experience among the dancers and the dances were practised but not perfect. The dances were lively and all the dancers very evidently enjoyed performing them. They took pleasure in dancing with each other and for their audience. I couldn’t help thinking that it must have been very similar at many real balls in the 18th century – except that we may well have danced better than our forebears did. Authenticity surely resides as much, if not more, in the spirit of the reconstruction as in the letter. This entry was posted in Ballet de Cour, Ballroom Dancing, The Cotillon, Thinking about Dancing and tagged Ballet de Cour, Cotillion, Jacques Dezais, Louis XIV on September 14, 2015 by moiragoff. There are just two more dances in Dezais’s 1725 Premier Livre de Contre-Dances that I haven’t considered yet – L’Inconstante and L’Esprit Follet. Again, I won’t look at the choreographies but pursue the sources of the dances’ names. L’Inconstante, for four dancers, is the second dance in the collection. Its duple-time music is identified on the notation as a tambourin. The music has A and B strains of eight and sixteen bars respectively, while the dance has the ‘Change’ and ‘Figure’ structure of a cotillon. So far, I have not been able to find a plausible source for the title. Marivaux’s play La Double Inconstance was given at the Thêâtre Italien on 6 April 1723, but there seems to be nothing to link it to Dezais’s choreography. It is interesting to note that, in London, Farquhar’s play The Inconstant was revived at the Drury Lane Theatre on 16 October 1723. It is unlikely that there is a link, so is there another source which also flirts with the idea of inconstancy? L’Esprit Follet, for eight dancers, is the seventh dance in the Premier Livre. The duple-time music is titled ‘Rigaudon’ but has the half-bar upbeat of a gavotte. The A strain has four bars and the B strain has eight. The dance has the familiar structure of a cotillon. I haven’t got to the bottom of this title either. ‘Esprit follet’ can be translated as ‘goblin’, which gives me the idea of mischievous (if not malicious) playfulness. Esprits follets featured in the ballets de cour of the mid-17th century and there is a 1684 play by Noël Le Breton de Hauteroche titled L’Esprit Follet. There is no singing or dancing in any of the editions I’ve looked at, so I’m tempted to go in a different direction. The repertoire of the Italian comedians in 17th-century Paris included a play entitled Arlequin Esprit Follet. I haven’t been able to track down any performances in Paris either at the fairs or the Théâtre Italien in the early 18th century, but a piece with that title was played in London intermittently between 1719 and 1735. The earliest of these performances were given by a troupe led by Francisque Moylin which included the Sallé children Francis and Marie. This suggests that Arlequin Esprit Follet was a given regularly in Paris and elsewhere. In the absence of a text and, particularly, any music it is impossible to prove, but could Dezais’s cotillon L’Esprit Follet draw on music from the commedia dell’arte piece Arlequin Esprit Follet? Do such links, which may be less tenuous than I suggest, say anything about the spirit in which these contredanses should be performed? This entry was posted in Country Dancing, The Cotillon and tagged Baroque Dance, Cotillion, Jacques Dezais on September 8, 2015 by moiragoff. Le Cotillon de Surenne, for eight dancers, is the fourth contredanse in Dezais’s 1725 Premier Livre de Contre-Dances. The music is a gavotte, with A and B strains of four bars each, and the dance has the cotillon ‘Change’ and ‘Figure’ structure. I’m not going to examine the choreography. Instead, I’ll pursue possible sources for the name of this dance. Surenne (also spelled Suresne in the 18th century, and now Surêne) is a place in the environs of Paris. Nowadays, it lies within the city’s suburbs around six miles west of its centre. In the 1700s, it seems to have been somewhere that Parisians went for entertainment. Could the title of Dezais’s choreography refer to this? Or could it be linked to a short comédie-ballet, written by Florent Carton Dancourt , with the title L’Impromptu de Suresne? According to the title page of the libretto published in 1713, this piece was played that year by the ‘Comediens du Roy’ at Surêne itself. The composer of the music is not named. Pour venir rire à Surêne. While the music is recognisably a gavotte, and has A and B strains of four bars each, it is not the same as that of Dezais’s cotillon. It may or may not be the original music for the divertissement. It is possible that Dezais drew on earlier music for L’Impromptu de Suresne. It is more than likely that his title Le Cotillon de Surenne refers to the pleasures to be encountered just outside Paris. This entry was posted in Country Dancing, The Cotillon and tagged Baroque Dance, Cotillion, Jacques Dezais on September 6, 2015 by moiragoff. The first dance in the 1725 Premier livre de contre-dances is the Cotillon Hongrois for four. I cannot identify with certainty a person or an event that might have inspired the name ‘Hongrois’ but in this post I will explore the wider context for the dance and put forward a suggestion. Hungary was the largest territory within the Habsburg Austrian monarchy. Charles VI was Holy Roman Emperor, ruler of Austria and King of Hungary from 1711 until 1740. He was also Prince of Transylvania, which had once been part of Hungary and retained strong links with that country. The history of the area in the 17th and early 18th centuries is complex. I will not even attempt to summarise it, except to say that events there influenced and were influenced by what was happening in the rest of Europe. In his XIIIe Recueil de danses pour l’année 1715, Dezais included La Transilvanie a ballroom duet by Claude Ballon. This choreography has some resemblance to a cotillon. The music is in duple time and, according to Francine Lancelot in La Belle Dance, it is very similar to a gavotte. The musical structure is AABACAA. The choreographic structure has ‘verses’ and a repeated ‘chorus’. The step sequence for the opening section is used again for the third and fourth A repeats, although the direction of travel and the floor pattern is varied each time. This, of course, is the collection in which Dezais advertises his manuscript versions of contredanses for eight, two of which (Le Cotillon de Surenne and L’Esprit Follet) were finally printed in 1725. Although it is not mentioned, was the Cotillon Hongrois another dance that significantly predated its appearance in the Premier livre? There may, perhaps, be a specific reason for the name La Transilvanie. Before the accession of Charles VI in 1711, the Prince of Transylvania had been Francis II Rácóczi. He led an unsuccessful uprising in Hungary in the early 1700s, with initial encouragement from the French. Between 1713 and 1717 he was in exile in France. Was La Transilvanie dedicated to him? Does the Cotillon Hongrois date to the mid-1710s rather than the mid-1720s and does it refer to Rácóczi and his exploits in Hungary? 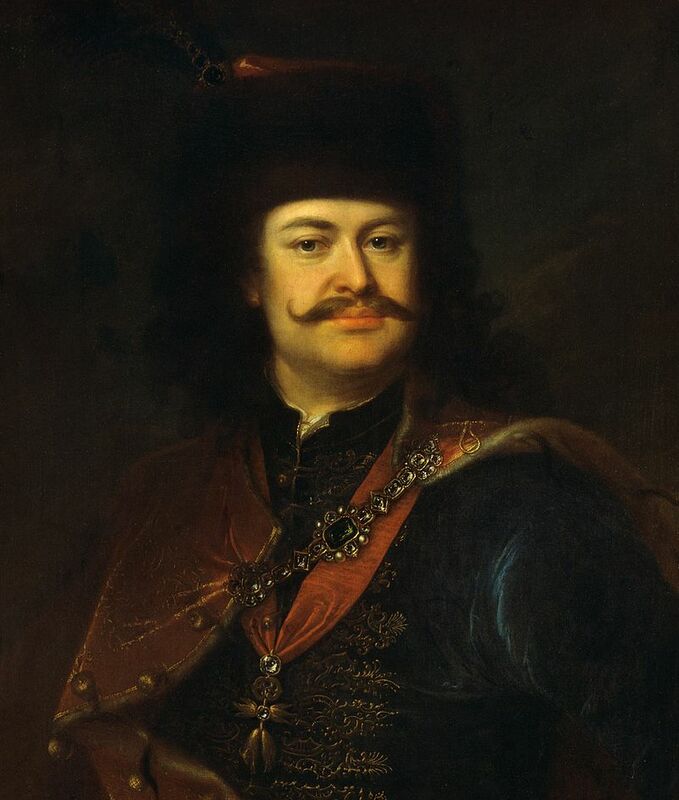 A portrait of Rákoczi shows him in dress similar to a hussar. Did this depiction influence the Hungarian dances that were popular on the London stage in the 1720s and 1730s? I will look at these in a separate post. This entry was posted in Ballroom Dancing, The Cotillon and tagged Baroque Dance, Claude Ballon, Cotillion, Jacques Dezais on July 23, 2015 by moiragoff. The ‘Avertissement’ reveals the popularity of cotillons in the early 1700s. It also highlights the topicality of some of the dance names. ‘la Utrech’ must surely refer to the Peace of Utrecht, the name given to the several treaties signed in Utrecht during 1713 and 1714 which between them ended the War of the Spanish Succession. Dezais published Le Cotillon des Fêtes de Thalie in his XIIIIe. Recueil de danses pour l’année 1716. Mouret’s opéra-ballet Les Fêtes ou le Triomphe de Thalie was first given at the Paris Opéra in 1714. Le Cotillon de Surenne and L’Esprit Follet must surely be the choreographies published in the 1725 Premier livre de Contre-dances so they were not quite so topical when they finally appeared in print. I will try to unravel the references within the names of both in later posts. I will resist the temptation to investigate the other dance names in Dezais’s 1715 list. As several dance historians have noted, the names of dances may indicate that they were created some years before being published in notation. The discrepancy in dates (which may not be obvious) can also lead to false conclusions when trying to discover the references within dance names. My suggestions for the dedicatees of Dezais’s contredanses L’Infante and La Carignan may, or may not, be correct. This entry was posted in Country Dancing, The Cotillon and tagged Baroque Dance, Cotillion, Jacques Dezais on July 20, 2015 by moiragoff. Many ballroom duets and country dances have distinctive names. These might link the choreographies to their music, to a play, or to a place or a dedicatee. Dance names provide glimpses of the social and cultural milieu within which the dances were performed. I’ve been looking at the Premier livre de contre-dances published by Dezais in 1725 and I thought it would be interesting to follow up some of the dance names in this collection. At first, it seemed unlikely that I would be able to discover very much but as I pursued my research I began to see links with other areas of my dance history interests – the ballet de cour of Louis XIV, royal and aristocratic dancers and dancing on the London stage, among other topics. I very quickly gathered enough information for several posts. I’ll look at just a couple of the dance names here, both linked to royalty. L’Infante, the third dance in the collection, is a contredanse for eight with a structure similar to the later cotillon. The name obviously refers to a Spanish princess or Infanta. The French and Spanish royal families intermarried several times during the 17th and 18th centuries. Louis XIV’s mother was a Spanish princess and so was his wife. 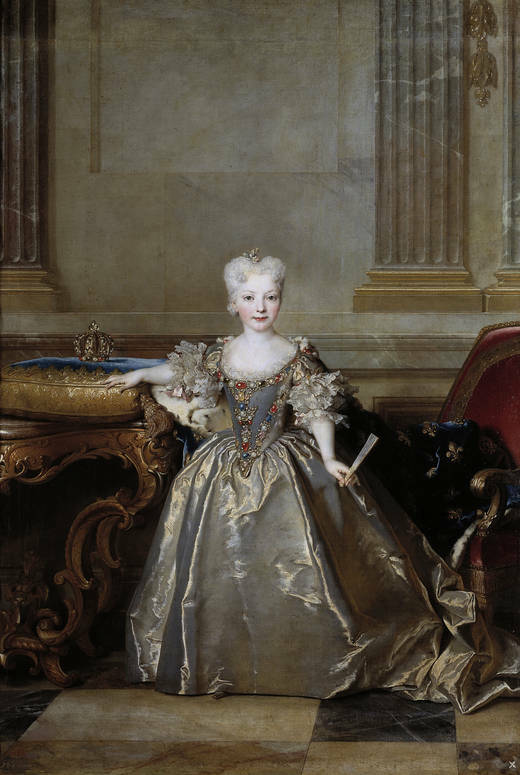 His successor Louis XV was briefly betrothed to the Spanish infanta Mariana Victoria. She was the daughter of King Philip V, younger brother to Louis’s father the duc de Bourgogne, so the two were first cousins. She arrived in Paris in 1721 to live at the Palais du Louvre until she was old enough for the marriage to take place. The young King was eleven, but his intended bride was only three years old. By 1725, following the King’s serious illness, the King’s ministers had realised they must find a princess who was old enough to be married and quickly provide an heir to the throne. The betrothal with the little Infanta was ended and she was sent back to Spain in March that year. In September 1725, Louis XV married the 22-year-old Polish princess Marie Leszczyńska. Mariana Victoria married the Prince of Brazil, heir to the Portuguese throne, in 1729. Was she the Infanta of Dezais’s contredanse? La Carignan, the last dance in the Premier livre, is a minuet for four. The dance’s name links it to the royal house of Savoy. Victor-Amedée of Savoy, prince de Carignan was probably the dedicatee of Pecour’s ballroom duet La Carignan, published by Feuillet in the IIme Recueil de danses de bal pour l’année 1704. Dezais’s contredanse may have honoured another member of the Savoy-Carignan family. Victor-Amedée, his wife Marie-Victoire of Savoy and their children had been resident in France since the late 1710s. Their daughter Anne-Thérèse, born in Paris in 1717, is a possible dedicatee of the 1725 choreography. These dance names, like many others, were topical, but were dances always created – and named – close to their publication date? This entry was posted in Ballroom Dancing, Country Dancing, The Cotillon and tagged Baroque Dance, Cotillion, Jacques Dezais, Louis XV on July 18, 2015 by moiragoff.